new on Adenium, this would make players big headache however the judgment from them is final. Here below is the table shown what criteria jury use for winning Adenium’s judgment. 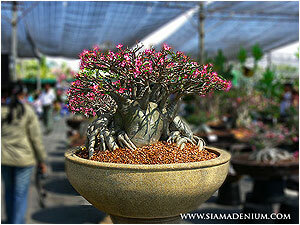 Flowers Leaf must be look fresh and mostly green not look messy because this will conceal the branch. Flower should be fresh, not burnt from disease or insect. 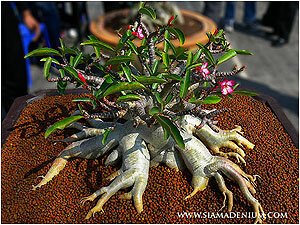 This is like big picture of adenium plant considered by items above. Plant should be matched with pot size and style. e.g. 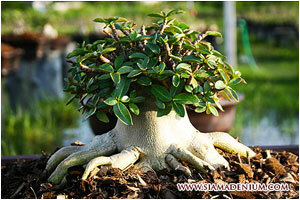 Adenium chubby or compact form should be grown in shallow pot or bonsai tray, tall style like Adenium somalense should be grown in tower pot. Clean pot, media surface and plant should look clean during preparation before contest begins.